We are dedicated to providing patients and healthcare providers with up-to-date information on our performance, as measured by process-of-care benchmarks established for hospitals nationwide by the Centers for Medicare and Medicaid Services (CMS). 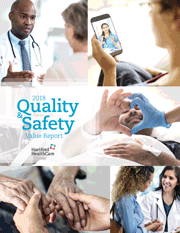 We have initiated multiple quality-improvement efforts with the goal of improving patient safety and medical outcomes as we provide compassionate, appropriate and efficient care. We have joined with other hospitals across the U.S. in efforts to improve performance. We provide links to some of the organizations that require or encourage patient safety and quality efforts. With the changing healthcare landscape, organizations are being tasked to rethink the way they deliver care with the goal of optimizing outcomes and reducing costs. Hartford Healthcare (HHC) has identified care redesign as a strategic priority and has launched the Clinical Care Redesign (CCR) program. The CCR program utilizes quality outcomes to determine opportunities to improve performance, reduce clinical variation, and reduce cost of care in specific service lines. To successfully execute this program, a comprehensive, yet manageable playbook has been developed to guide clinical teams to successful implementations of industry best practices. This playbook is a “how-to” guide for clinicians, leaders, project managers and multi-disciplinary teams. The playbook breaks up an otherwise daunting world of clinical process improvement into practical phases, simple tools, checks and balances using a step-by-step approach. The playbook includes flexible processes, timelines and templates to facilitate a hardwired and repeatable process.